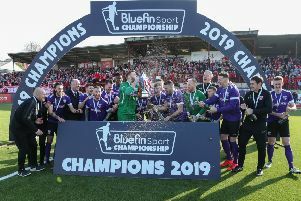 After two postponements Larne finally got to face Limavady United in the Irish Cup at the weekend and boss Davy McAlinden was delighted with his side’s 2-0 success. Substitute John Donnelly came off the bench to break the deadlock in Saturday’s tie before Guillaume Keke fired home a late penalty to set up a fifth-round trip to Loughgall. It may not have been a match that will live long in the memory, but for McAlinden it was job done with his team putting their club’s name the hat. “It wasn’t pretty but the important thing is that we are in the next round,” McAlinden admitted. “I didn’t think we were under pressure at any time and we always felt if we chose better we could get the goals. “Donnelly, who was unlucky to start on the bench, then came on and told me what to do with my selection and I am delighted for him as he has a great attitude. Throughout the team we maybe lacked a little quality but maybe that is due to a lack of sharpness with the two-week break. Goalscorer Donnelly added: “I was disappointed not to be starting, but it happens and the boss then had faith in me to send me on to do a job. “Thankfully I scored and then Keke added the second. I need to show the boss that I want to be playing every week and I will keep working hard.